Oliflix is ​​a passion for our roots in the culture and crafts of olive oil extra virgin as natural, trying to be faithful to our ancestors, with their wisdom and the desire to do a good work, in the organic cultivation of the olive and crafts processing, is the result of a young and dynamic team with excited to share our work for the maintenance of traditions in the production of oil in the purest artisanal way. As with the mill, we have also recuperated the traditional elaboration systems of olive oil, so that we can enjoy an extra virgin olive oil elaborated with all our craftsmanship. At the same time and following with this line, we also elaborate natural table olives with all our craftsmanship and with the ingredients that nature has provided us with. In addition we have an organic variety of the extra virgin first pressing olive oil as well as of the natural table olives. This variety comes from organically grown olives, whose olive-trees are not applied any chemical fertilizers or pesticides. Oliflix is situated in the superb meander of the River Ebro. It has an excellent communication system, by train or by road; it takes hardly 30 min. from Lerida to Flix and hardly 45 min. from l´Hospitalet to Flix. We recommend you to visit the mill in the harvest time (winter). Visits, which are guided and free, are offered to students, academics, associations and public in general. For more information check contact page.
. We recommend you to make a reservation in advance. If there were "Oscars" in the world of food they would be given by Guild of Fine Food Retailers. This establishment has had the pleasure of awarding Olidlix the silver medal in 2005 and the gold ones in 2006 and 2012 in reward for manufacturing the very best quality oil. The quality is based on its olives and on its manufacturing process to bring out the olive oil’s best qualities. Production of extra virgin olive oil is from the first pressing in cold, using traditional methods, so Oliflix is a company unique and special on an European scale and it deserves the award given to. Flix is a town in Catalonia, in the province of Tarragona, Spain. Part of the comarca of Ribera d'Ebre, situated north it. It borders with the regions of Segriá and Garrigues. Flix is situated on a magnificent meander of the river Ebro from which comes the name of the town (flexu, meander in Latin). It has a reservoir (1940), and a hydroelectric power plant. As historical and artistic heritage, are the remains of a medieval castle (the old castle), New Castle (Carlist Wars) and the church of Our Lady of the Assumption (late Gothic). In Oliflix we promote an ecological environment because ecological farming means that producers must respect and also protects the environment. 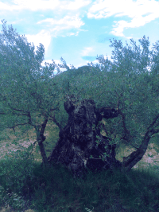 The “alpechin” which is the vegetable water from the olive itself, is a very pollutant by-product for the acuifer systems due to its high content in organic matter. See the organic fraction in Appendix 1 and see the main components of the mineral fraction in Appendix 2. In our programme for promoting the environment the “alpechin” is used as an organic fertilizer for sunflower, corn, barley and olive tree farms.